At the end of rehearsal, Mr. Gutierrez gives some final notes. Should public figures from the past be judged by today’s moral standards? Ninth-graders chose that topic for the Freshman Forum because of its relevance, especially with recent controversies regarding the reevaluation of the legacies of John Wayne, Michael Jackson, and others. Mr. Gutierrez provides advice during Forum rehearsal. Aidan and Mary fine-tune a speech. Aidan practices his speech at Thursday’s rehearsal. Mary takes her turn during rehearsal. Moderator Eliza Nicosia opens the discussion with initial comments on the Forum topic. Margot Queenan makes her arguments. Mansa Brown-Tonge suggests that education is the key. Mary Cotter states her position at the Freshman Forum. Aidan Wun argued that one’s personal views should not be regarded in assessing their professional work. Forum judges Caroline Hill ’06, Ebets Judson ’64, Ken McCurdy, Bryan Hickman ’63, Toddy Hunter ’58, and Wendi Plenge ’78 take a moment to collect their thoughts at the conclusion. Freshman Forum participants with judges: Ken McCurdy, Wendi Plenge ’78, Toddy Hunter ’58, Ebets Judson ’64, Mary Cotter ’22, Bryan Hickman ’63, Aidan Wun ’22, Mansa Brown-Tonge ’22, Caroline Hill ’06, Margot Queenan ’22, and Eliza Nicosia ’22. Eliza Nicosia set the stage as moderator, introducing the topic and each of the panelists’ positions. She also managed the question-and-answer period at the end, which had more questions than most Forums, a good sign that the audience was engaged with the topic and presenters. Margot Queenan started off the position speeches, arguing that problematic public figures of the past should be strictly judged by today’s standards, and all honors bestowed upon them should be withdrawn. Mary Cotter, on the other hand, argued that all the statues should stay up and that the revered public figures’ reputations should stay intact because it is unfair to judge someone from the past by modern-day standards. Mansa Brown-Tonge stated that we need to start by educating Americans on our country’s mistakes, but taking the statues down would not be feasible. Aidan Wun concluded by saying that one’s personal beliefs should not have an impact on their professional accomplishments and that all dedications made in honor to the historic figures should stay. I thought the Forum went really well. I’m really proud of the freshmen and really excited for them. I kind of knew from the beginning with this group that it would go well, that they would do a good job. They’re just really engaged and motivated students; they’re curious about the world around them, especially social issues. I could tell from when they came in and were discussing possible topics that they were excited. That being said, when we first started writing our speeches and getting ready, it was a little rough; but, they all invested themselves into the process. They all wrote outlines and talked to each other, they did rough drafts, shared them with me, with parents, with other English teachers and history teachers. We must have gone through about three or four drafts with most of them. Then the last couple of days, it really came together when they practiced, and I could tell that they were not just nervous but excited. So, I’m glad it went so well for them. Many thanks to the judges who provided such valuable feedback to the Forum students: Caroline Hill ’06, Ebets Judson ’64, Ken McCurdy, Bryan Hickman ’63, Toddy Hunter ’58, and Wendi Plenge ’78. 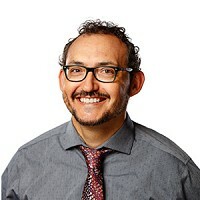 Rodrigo brings 14 years of experience, having served as a history and geography teacher in public, private, and charter schools in Texas, Connecticut, Arizona, and Delaware. In addition to teaching, Rodrigo has also served as a Department Chair, baseball and basketball coach, and mock trial advisor. He earned his Bachelor of Arts Degree in History from Yale University and his Master of Arts Degree in History from the University of Texas, Austin.